For about ten years, I worked for one of the largest healthcare companies in the world, in many different roles. My last being in medical education, working with experts around the globe who specialized in trending healthcare topics and quality initiatives. The work was very exciting and fulfilling, yet, when I thought about my future, it didn’t seem that corporate life was the best fit for me. 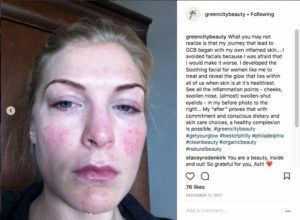 Around that same time, I developed an inflammatory condition that affected my facial skin and suffered from significant and painful symptoms. While I was able to relieve some symptoms with a change in my daily regimen and through discontinuing the use of certain products, there weren’t any specific recommendations for the long term. Even after working with several healthcare professionals. Within two years, I decided to make a huge career change. My skin condition was not getting better, and it was frustrating to the point that it motivated me to enroll in an esthetician program. I believed if I could learn more about how the skin functions, I could find more effective ways of dealing with my symptoms. I left my job, sold my house and possessions, and moved to Philadelphia. At the same time, I also enrolled in a night program in the Small Business Development Center at the Wharton Business School. The course focused on making the leap from being an employee to an entrepreneur. 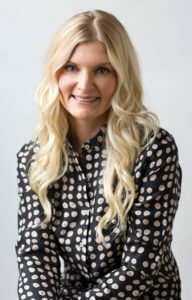 After a year of schooling, I was more knowledgeable about skincare, as well as owning a small business. I had worked with many different specialists within the integrative medicine community and learned a lot about functional medicine. I had this new-found knowledge but didn’t want to work in a spa and perform services or use products that I didn’t truly believe in. There weren’t many spas in Philadelphia where I could practice the way that I wanted to, so I decided to start my own business. An important part of the Wharton program was to create a strategic business plan, so I knew “what’ I wanted to accomplish. It was the “how” part that I was still uncovering. The start of my new business happened somewhat by chance. I met another local small business owner who was just getting started as well. She had more space than she needed and wanted to align herself with an esthetician. We ended up sharing the space and I started my business. 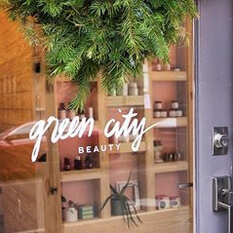 Green City Beauty was born! We shared the space for several years and that allowed me the time to further refine my business plan. I had the opportunity to experiment and perfect the concept. I started small and organically with no formal advertising or marketing, it was all word of mouth and referrals in the beginning. It was the foundation that has built the business that I have today. When I started the business, I knew it had to be something different. 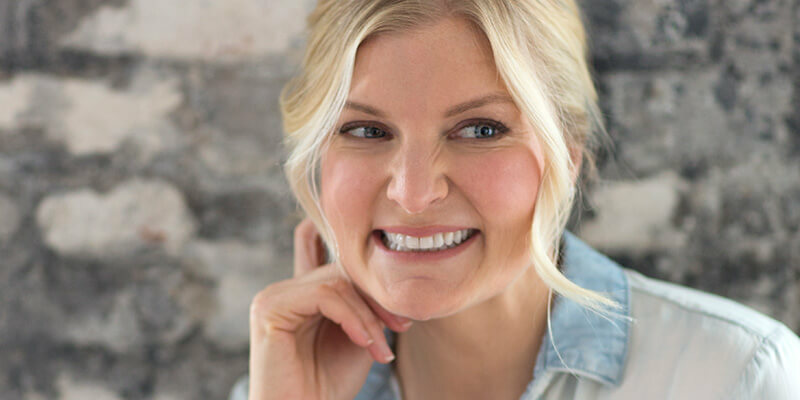 Suffering from symptoms I previously experienced with my skin, I wanted to offer services that would advance the practice of esthetics and were as skin friendly as possible. I learned about waxing in school and it just wasn’t something that fit within my own core beliefs. We also learned about sugaring, a technique we studied conceptually but didn’t practice because at the time it wasn’t offered by local salons. First discovered in ancient Egypt, sugaring is a more natural way of removing hair that uses an organic sugar paste, consisting of only sugar, water, and lemon juice. It also hurts less and provides a cleaner, less abrasive extraction. My preferences were more in line with this technique so I enrolled in a training program in Los Angeles. I came back to Philadelphia and perfected the craft. 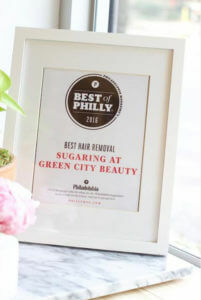 Green City Beauty is the first business in Philadelphia to offer sugaring services and is responsible for creating a market for sugaring and awareness that had not previously existed. I’m also working with small, high-quality independent skin care brands. I’ve developed relationships with the brand developers and have come to know their motivations for starting their companies. I respect their philosophies and methods of producing the best products that we can confidently use on our skin. It has been personally rewarding to offer unique services that I truly believe are better than what was traditionally available. I know that I am offering a better solution both in hair removal and in skincare. When I sit back and think about it all, I’m proud of what I’ve accomplished. I’m also thankful because not everyone is able to do what I did. I left behind a comfortable salary and a world in which I was afforded lots of opportunities financially. I knew that to implement this plan, I had to limit my expenses and prepare myself for a significant transition. It was a five-year process to develop from my original business plan to the point at which the business operates today. Embarking on an entrepreneurial path can be a long journey. To be successful, you must be able to “keep the lights on”, so to speak. The thought of “how am I going to pay next month’s bills” is frightening. Under-capitalizing is a leading cause of failure and major concern for start-ups, especially for small businesses like mine. Being in a niche market layers on even more obstacles. You must know exactly who your customers are, how you’re going to reach them, and how to efficiently manage your budget. Cost containment and resource management are important because you don’t have much room for error. It’s also critically important to know your message. If it is ultimately going to inspire people, it must be authentic. I felt so strongly about what I was doing, and I wanted to be an example of how to overcome a personal struggle and to be of help to others. Thankfully, I continue to have an incredible support system behind me. My dad is someone who supports and recognizes that hard work pays off; I get my drive and discipline from him. My mom always said, follow your dreams, you can do whatever you set your mind to. My husband is and has been my biggest supporter and fan. He’s also my accountant so he helps keep all the financial aspects of the business in order as well. As my business continues to evolve, I have many goals. I’d love to share my story, connect with other women entrepreneurs, helping them fulfill their dreams of having businesses. Also, I’d like to be more of an educational resource on sugaring because we’re still one of the only places offering it in Philadelphia. That suggests an opportunity. Ultimately, I want to develop the business into a broader wellness brand, sharing my personal experiences on the journey of wellness. Advice I have for others thinking about an entrepreneurial career change is you must be your brand and embody what you want to create. If your message is believable and passionate, I really do think that people listen. There is so much to say for authenticity. I’ve focused on throughout this journey is to be my authentic self. Whether or not people agree with it, they still respect it. I can’t stress enough the need for a strong business plan. If you don’t have the budget or finances to fulfill your vision, start small and do what you can afford. Your passion will bring you a long way. If your message is strong enough that other people relate to it, you will be successful! Barbara Holmes Achieves Lifelong Ambition of Becoming a Model: in her ‘50’s!